CKEditor 5 real-time collaboration features let you customize any CKEditor 5 build to include real-time collaborative editing and commenting features and tailor them to your needs. Share the complete URL of this page with your colleagues to collaborate in real time! Real-time collaboration features include three separate plugins that can be customized and used independently of one another with any CKEditor 5 build. 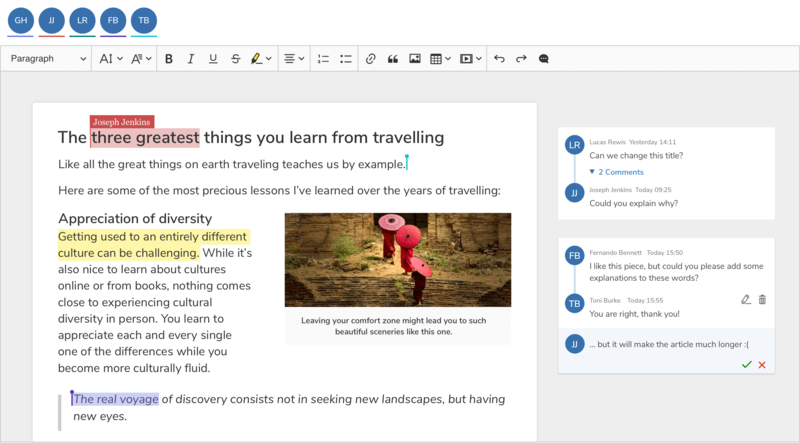 Real-time collaborative editing – Allows for editing the same document by multiple users simultaneously. It also automatically solves all conflicts if users make changes at the same time. Real-time collaborative comments – Makes it possible to add comments to any part of content in the editor. Users selection and presence list – Shows the selection of other users and lets you view the list of users currently editing the content in the editor. All of the above features are fully adjustable. This makes implementing real-time collaborative editing within your application a highly customizable out-of-the-box experience. Our React, Angular 2+, Vue.js integrations as well as the multi-root editor functionality are currently in the polishing phase in order to fully enable real-time collaboration feature. All known issues should hopefully be solved until the end of April 2019. If you are already working on such integrations and encountered any issues, please contact us for more details. The real-time collaboration feature needs a cloud service to synchronize content between the clients, so first you need to sign up to the Collaboration service powered by CKEditor Cloud Services. Refer to CKEditor Cloud Services Collaboration - Quick Start for more details. Then, you need to create a custom build, because this plugin is not included in any of the official builds offered. The following instructions describe step-by-step what you need to do. To enable real-time collaboration, you need to create a custom CKEditor 5 build that would include the real-time collaboration feature. Note that your custom build needs to be bundled using webpack. Voilà! All users who open this page should be able to collaborate, working on this rich-text document at the same time. Although classic editor was used in the example above, real-time collaboration, like every other official CKEditor 5 plugin, will work with any editor creator. Since you have a working sample of rich-text editor with real-time collaboration, it is time to learn a little more about how the configuration works and what customization options you have. See further real-time collaboration guides to learn more.